Have you ever wondered about the plumbing history of the Harry Potter franchise's Hogwarts? Regardless of your answer, J.K. Rowling has revealed that the legendary wizarding school started without bathrooms. So, if there were no bathrooms, what did the wizards and students do when they needed to go number one or two? Thankfully, Rowling has an answer for that too, and it's not a very pleasant thing to think about. But then again, when is using the restroom ever a really pleasant thing to discuss or think about? J.K. Rowling and her official Harry Potter website Pottermore has answered the question that not a whole lot of people were asking. Bathrooms play a big part of the story in the franchise, but as it turns out, it wasn't always that way. Indoor plumbing is a Muggle invention, so there was some apprehension to adopt the idea at Hogwarts, apparently. The Pottermore site explains. "Hogwarts didn't always have bathrooms. Before adopting Muggle plumbing methods in the eighteenth century, witches and wizards simply relieved themselves wherever they stood, and vanished the evidence." Okay, standing to urinate makes sense for male wizards, but what about the females? And where does the waste get "vanished" to, can the urine be removed off of one's legs or robe when it's magically taken away? J.K. Rowling just opened up a whole can of gross worms. What about going number 2? One cannot stand and do that, not even a wizard, there's no way. Plus, it has been proven that there is not a "disappearing" spell, which means that it all has to get transported somewhere. 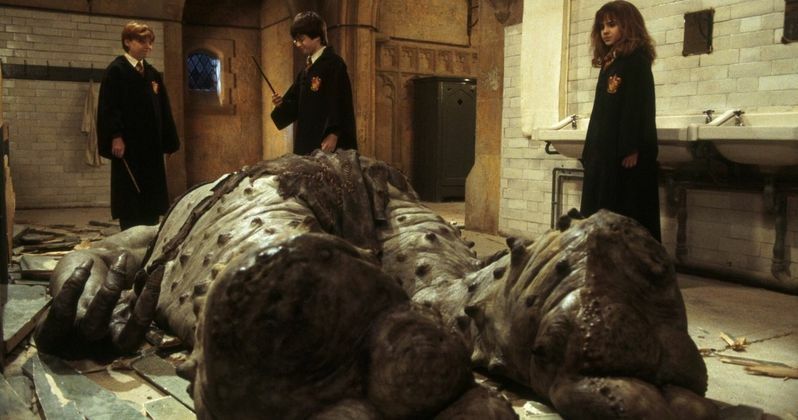 Where is that place and did the young wizards ever make any mistakes when getting rid of their waste? Let's not even get started on this whole, "wherever they stood" concept. Plumbing is pretty recent invention in the world of Muggles and it was only really adopted after it was linked to disease. For most of that time, Muggles used chamber pots and did away with them wherever they pleased, which obviously isn't as elegant as using a spell, but it's all that they had at the time. This meant that most of the waste ended up in the streets and ultimately into the water, which caused a lot of people to get sick and die. Even Ancient Rome had plumbing. C'mon, J.K. Rowling, this is messed up. Thankfully, the Harry Potter movies featured bathrooms and we weren't subjected to a wizard shaking something out of his robe while teaching students. J.K. Rowling more than likely wouldn't have sold as many books and we might not even be talking about the bathroom habits of Hogwarts residents had she left this detail in. Whatever the case may be, we now know that Hogwarts wasn't always such a magical place after all. All kidding aside, the Pottermore Twitter account released this nugget of information for National Trivia Day. So there you go, impress your Harry Potter fanatic friends with this important knowledge.